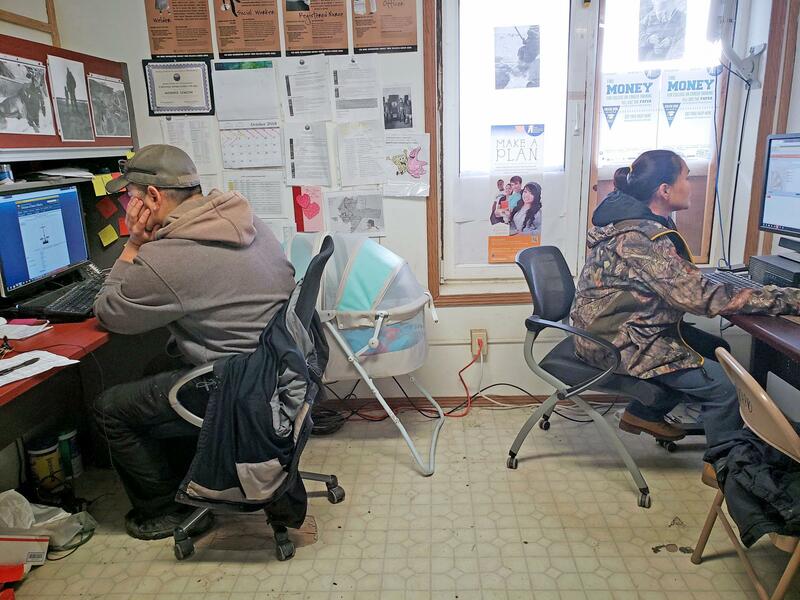 Tribal Workforce Development clients study for a permit test [left] while [right] another client completes her GED requirements at the Hooper Bay Job Center. The U.S. Census kicks off in Toksook Bay in January of 2020, and the Census Bureau is looking for workers in every Yukon-Kuskokwim Delta community to go house-to-house counting their neighbors. The Census Bureau has reached out to the Association of Village Council Presidents to help them fill positions, and AVCP is encouraging TANF recipients to apply. TANF stands for Temporary Assistance for Needy Families. “We have a partnership agreement with the Census Bureau where any individual who is currently receiving TANF, needs work experience and on-the-job training, the Census will have a hiring preference for those individuals," explained AVCP Workforce Development Director Yvonne Jackson. Jackson says that TANF recipients hired by the Census Bureau will receive a waiver so that their employment will not infringe on their TANF benefits. The census will pay $28 per hour and provide one to three months of work. Job qualifications include being at least 18 years old, having a valid social security number, being a U.S. citizen, having a valid email address, and passing a criminal background check. Applications can be submitted online, and you can visit any of AVCP’s 23 job centers across the Yukon-Kuskokwim Delta to get assistance for submitting your information. “We click the link to open up the employment application and walk through the employment application with our clients, make sure that they’re submitting a nice resume and cover letter and anything else that could enhance their application for the selection process of getting an interview,” Jackson said. Accurate census data is important. The national census occurs every 10 years and counts the population size of each community. That information determines the community’s political representation and eligibility for government funding over the next decade.